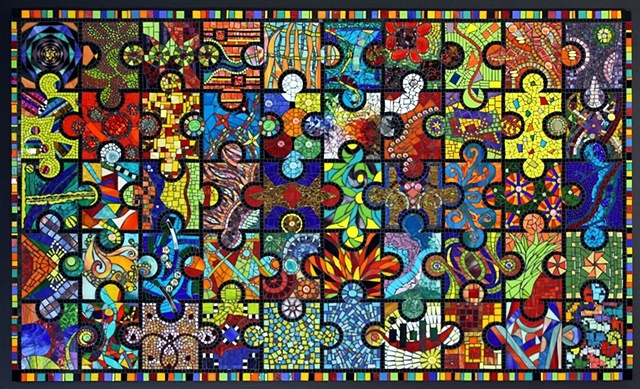 A 'jigsaw puzzle' that has drawn together with brilliant interpretation, abstract, contrast and colorful! Each piece is as separate and distinct as the artist who created it. Each of the puzzle pieces was created as an abstract designed to highlight color & contrast using all glass materials including: stained glass, vitreous tile, tempered glass, dichroic glass, mirror, smalti, plate glass, glass rods, photos, glass, millefiori, and polished rocks.